Wow! I can't believe how much I've gotten done in the last two days. I learned how to make flowers. I have two sets of cards done as well as a single card, a set of coasters that are one coat away from being done and I just finished up this pretty picture frame. All are headed right into the Crafters' Gift Boutique. It's amazing that I've accomplished so much since I've been spending as much time as I can with my boys. I've had such a good weekend. 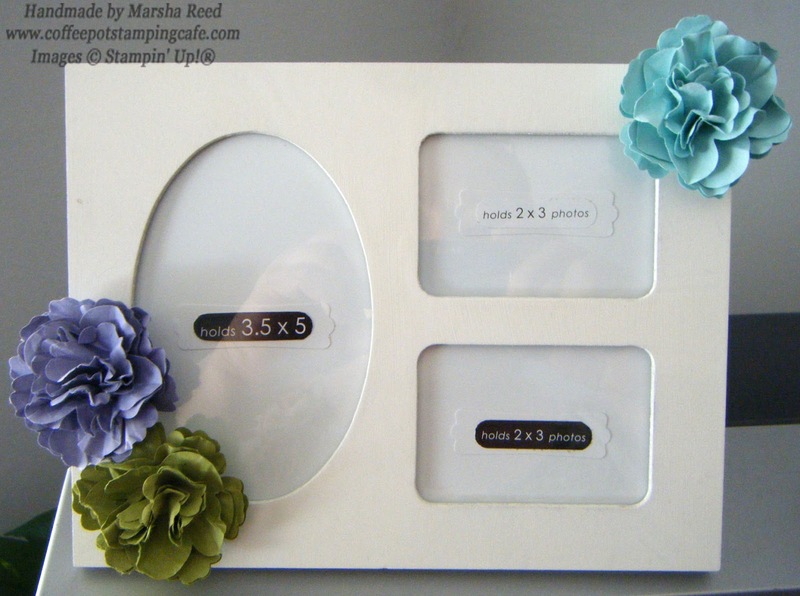 The flowers are made from the 2011-2013 In Colors Wisteria Wonder, Lucky Limeade and Pool Party Card Stock. I was surprised at how easy they are to make. I just kept putting off giving them a try. Silly me! Now that I mastered the technique, I know I'm going to be making more as well as learning how to make some of the other flowers I've seen. The new Annual Catalog debuts this Friday, June 1st. If you'd like a copy, contact me and I'll send you one. You are going to love all the new product!